Drupal 8 provides a reliable open-source, enterprise-level content management system (CMS). Using the Drupal 8 portal development tools, you can build a fully customizable developer portal. Because Drupal 8 is open-source, you can extend and contribute to the Drupal 8 portal development framework and leverage the knowledge of the Drupal community. The following table summarizes the Drupal 8 modules that are available for use with Apigee, and their corresponding Drupal release stage and GitHub Issue Queue for reporting issues. Contributions are appreciated, as outlined in the contribution guidelines for each project. API product RBAC enables administrators to configure access permissions to API products. Debug enables administrators to configure and manage Apigee debug logs. Teams (Experimental) enables developers to be organized into teams. 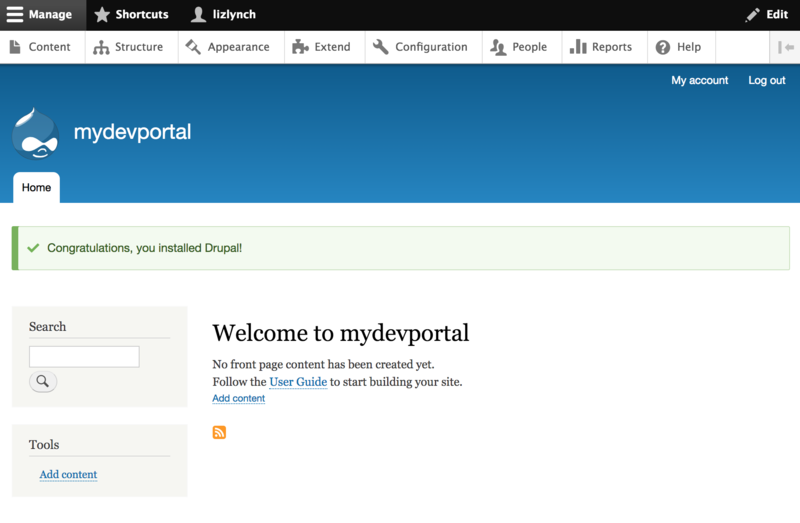 The following sections describe how to use Drupal 8 to develop your portal. Do not enable two-factor authentication on Apigee Edge if you are building a Drupal developer portal. Otherwise, the developer portal will not be able to communicate with Edge. The following section describe how to evaluate Apigee Edge in Drupal 8 in your local environment. Note: The Apigee modules require Drupal 8.6.x or higher and PHP 7.1 or higher. Composer Composer enables you to install Drupal modules with all of the required dependencies. For example, because the Apigee Edge module requires the Apigee Edge Client Library for PHP, it is recommended that you install Drupal 8 and its modules using Composer to facilitate and manage these dependencies. Lando Lando enables you to set up the infrastructure needed to run a Drupal CMS in your local environment using Docker containers. Note: Lando requires that you have a Docker account. See Get Started with Docker on the Docker site. There are several options available for setting up Drupal 8 using Composer, as described in Using Composer to manage Drupal site dependencies. The following procedure uses the Composer template for Drupal projects. Open a terminal window and create a directory names projects. Change (cd) to the projects directory. Note: You may need to replace composer with php composer.phar in the following command example if Composer is not in your PATH. See Installing composer globally to move Composer in your PATH. This command creates a new directory named d8-devportal in the projects directory and installs Drupal 8 and all dependencies in the web directory. Review the README file in the d8-devportal directory for more details about the installation. To run Drupal, you need to install a web server configured with PHP so that server requests are passed to Drupal’s PHP code for processing and to generate a response. Lando enables you to quickly set up a Nginx web server already configured with PHP to host Drupal in your local environment using Docker containers. Run the lando init command and respond to the prompts (shown in bold). This commands creates a .lando.yml file in the root directory. NOW WE'RE COOKING WITH FIRE!!! Your app has been initialized! `lando start` to get rolling. Check the LOCATION printed below if you are unsure where to go. Note: Before starting the server, you may want to disable metrics tracking in the ~/.lando/config.yml file. Respond to the prompts to configure and install the server. Note: Run lando info to view the database host name, username, password, and connection URLs. Choose language Choose your language from the drop-down (for example, English) and click Save and continue. Choose profile Select the Standard installation profile and select Save and continue. Install site A progress bar displays while the site is installed. Configure site Configure your site including administrator login and password information, as required, and click Save and continue. The default home page is displayed. Next, you need to install the Apigee modules to integrate your Drupal site with Apigee. Integrate your Drupal 8 developer portal with Apigee by installing and configuring the Apigee modules. The developer portal does not function as a stand-alone system. Much of the information used by the portal is actually stored on Apigee Edge. The Apigee Edge and Apigee Monetization modules that are installed on the portal act as clients for Apigee Edge and Apigee Monetization, respectively. Using the credentials that you configure, the portal initiates communication by making REST requests over HTTP and HTTPS. For example, when a developer registers a new app on the portal, the portal makes a request to Edge to send information about the app to Edge. Note: Apigee Edge is installed as a dependency in this case. In your browser, click Extend in the Drupal administration menu. Apigee Edge: API Product RBAC to enable admins to configure access permissions to API products individually. Debug helper Apigee Edge module to include additional debugging information in the logs. Select Apigee Monetization to install the Apigee Monetization module (if applicable). Optionally, select Apigee Monetization Add Credit to enable admins to support adding credit to a prepaid balance. Configure the connection to Apigee Edge. To render your OpenAPI Specification in Swagger UI, you can use the Swagger UI Field Formatter module. This module can be used to publish API Documentation created using Swagger or OpenAPI Specification, on any Drupal site. For more information, see Document your APIs using the Swagger UI on the Drupal.org site. Choose a provider to manage and host your developer portal, such as Pantheon, Acquia, or another provider. This project is in beta and is not supported under a service level agreement (SLA). To evaluate the beta, you are responsible for choosing and engaging with your preferred hosting provider. This section describes how to set up a local Pantheon site and install the Apigee Edge module on Pantheon. To install the Apigee Edge module you must use Composer to ensure all dependencies are downloaded and installed. Since you cannot run Composer directly from your Pantheon site, you need to check in to your site all files downloaded by Composer. This is required only if you are not able to run Composer directly on the server hosting your site, which is the case for Pantheon sites. You can use one of the following methods to set up Pantheon as your hosting provider. Composer without contiguous integration Set up a local Pantheon site quickly using Composer. Push updates to Patheon. This method is described in this section. Note: You will not be able to apply Drupal core updates using the Drupal site dashboard. To manage production environments, this method is recommended for advanced users only. Composer with contiguous integration Set up a development site to make it easy for your team to follow development best practices, such as using pull requests and automated testing. For more information, see the Pantheon build tools guide. Note: Ensure that you have installed Composer and Terminus. To set up a new Drupal site on Pantheon, in Drupal 8 and Composer on Pantheon Without Continuous Integration complete the steps up to and including "Installing Drupal." The other steps in the section are not required to set up a new Drupal site on Pantheon, but will help you understand the workflow for other tasks. Log in to your Drupal site as an administrator, select Extend, select the Apigee Edge module, and click Install.